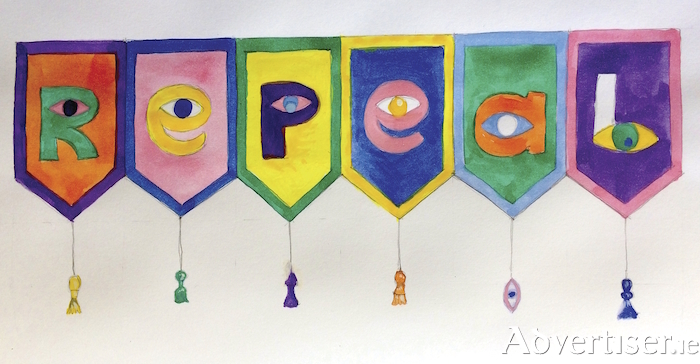 A banner designed by artist Áine Phillips which is currently on display as part of her Performaphilia exhibition at NUI Galway. Tomorrow we have a once in a lifetime opportunity to vote to remove the Eighth Amendment from the Constitution. At this point, we have all seen the posters and viral videos; we have received leaflets; and had conversations with friends and strangers. Tomorrow, it will be time to vote. If you have not yet decided how you will vote, I urge you to vote Yes. Let me explain why. After 35 years of the Eighth Amendment, we know it does not work. This referendum is not a vote on whether or not you agree or disagree with abortion. Abortion is already happening in Ireland. Between 2012 and 2016 alone, 715 women from Galway travelled to the UK to access abortion. This number does not count those who did not give an address, or the additional women who take unregulated and illegal abortion pills at home, alone, and without advice or support from their GP. We have returned to an era of backstreet abortion, and we can no longer ignore these facts or continue to export our women to the UK. Women deserve better. Tomorrow’s vote is whether you believe we should regulate the abortion that is already here and provide care to women who need it. As we know, pregnancy can go wrong. It is not a black and white issue and is certainly more complex than two lines in the Constitution, which is precisely what the Eighth Amendment reduces it to. This is why our nation’s top experts on women’s health, the Institute of Obstetricians and Gynaecologists, the current and former master of the National Maternity Hospital, and an unprecedented 1,500 doctors have all publicly joined together to call for the removal of the Eighth Amendment. They encounter women with unintended pregnancies. They diagnose fatal foetal anomalies. They are the ones we all trust in a crisis, yet they are unable to help their patients because of a few cold sentences in our Constitution. The reality is our laws are harming women. There are far too many high-profile cases of women dying as a result of the Eighth Amendment. What we do not often hear is that our laws can also cause serious risk to a woman’s long term health. Obstetricians have told us what that means. Women with complex medical conditions are at risk of being permanently disabled as a result of having to continue with a pregnancy - for example, a woman with diabetes who is at risk of going blind, or a woman who has high blood pressure who is at risk of having a stroke. This is currently the reality under the Eighth Amendment. We have to ask ourselves, as a country, are we OK with this continuing? Is this what you want for your daughter, sister, girlfriend, or niece? Right now we have an English solution to an Irish problem. We have never felt it appropriate for the English to represent our interests, and we should not accept this. If we remove the Eighth Amendment, we will allow Irish legislators to create Irish standards for care. The ones proposed here are in fact more restrictive than the UK, and in line with most other European countries. The proposed legislation will be a GP-led service with restricted access and key controls in place. Women will need to meet with their medical practitioner and have a 72 hour waiting period before accessing care. Nobody takes these decisions lightly, and the proposed legislation includes this reflection period to ensure this. As was mentioned in last week’s article, after 12 weeks an abortion will only be carried out if there is a risk to a woman’s life or a risk of serious harm to her health. In this instance, two doctors will be asked to determine if an abortion should be permitted. However, terminations in these instances will not be carried out beyond viability, which is reached at 24 weeks of pregnancy. The proposed legislation can be found here: https://health.gov.ie/wp-content/uploads/2018/03/General-Scheme-for-Publication.pdf. As noted, the proposal is to have a GP-led service, as is the standard of care in many other similar countries. The proposed GP-led service would break down as follows: If every GP provided the service, working off roughly 2,500 GPs in the country, and roughly 5000 medical abortions, that would work out at about two per GP per year. If just 100 GPs provide the service, that would break down as 25 per GP - which is one a fortnight. Many GPs are supporting this proposed system as this means they can treat their patients with care and compassion should they have a crisis pregnancy. This is what compassionate care would look like. This would mean doctors can treat their patients, and women can make informed decisions about their healthcare without the added stresses which being forced to travel abroad for abortion access would cause. It would mean women who are in difficult situations can access care at home. Tomorrow, we ask you to vote for compassion, care, and change. Ireland in 2018 is not the same as it was in 1983. We now know of the unforeseen, far reaching, and detrimental consequences of the Eighth Amendment. For all these reasons and more, I urge you to vote Yes, because a woman you love might need your Yes.